This class can generate label images for color coded resistors. It takes the resistance value of an electric resistor and generates an image for a page with a grid of labels that show the resistance value with the respective color code stripes, as well QR-code for the same for associated values. The class can generate the label images. The generated images are saved to a file in the PNG format and are embedded in the generated page HTML. It may also return a JSON encoded object with the label image dimensions and image data encoded in base64. 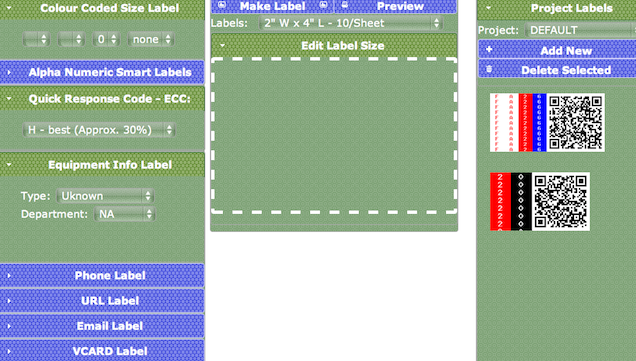 The size of the page and the number of labels in the grid are configurable parameters. What is the best PHP qr code generation class? Number 4 Resistors are components used frequently in electronic devices. They usually have color coded stripes that tell what is the resistance value of the resistor. This class can generate labels suitable for printing that use the same color coded stripes used in resistors. I currently work as a Tech in the Staging and AV world with various companies and I have noticed that many companies don't really follow a single industry standard for labeling their many cables, cases, lighting, audio, etc. I wrote this program to help solve a problem that can help companies adopt a single standard for color coded labeling based on the resister colour code for 0-9. The numeric codes are a maximum of 3 characters 0-9 and a letter for meters or feet. QR code generation is placed beside the colour coded label. differently or not at ALL! on a job site. An example of the dilemma I would face when looking for a 50 foot cable; which cable is more likely to be a 50 ft cable marking that is clear? - The one with the red label? - The one with the white label? - The one with the yellow label? - Green and Black label? The QR code generation is from [phpqrcode](http://phpqrcode.sourceforge.net), this works very well and can be turned off in the class (not in the demo). The QR code size (1 to 40) will be set based on the input string length and ECC level, all the maximum alphanumeric lengths I test against are listed on this [site](http://www.qrcode.com/en/vertable4.html) (link to page 4/4). I've noticed that stretched QR code images don't work with Norton Snap on my iPhone 4, test your labels before you print any. I have 2 iPhone Apps for testing QR codes, Norton Snap and QRdeCODE. The GigCableLabel demo will demonstrate this class in a RESTful Setup with PHP 5.3 and jQuery. GET the label, PUT the label in the project directory, DELETE the selected labels from the project directory and POST a new project for labels. There is still more work todo to make this tool a success, the UI is still very beta, view the [Demo](http://www.salamcast.com/demos/GigCableLabels/). - double click the new label to clear the new image and close the window or drag and drop the label on the project window to save it. - added some multilingual support, English and goggle translated French, Arabic will be next -- Inshallah. - Multiple projects are now supported for multiple shows, shops, etc and can be made and loaded dynamically. ### A look at the giglabel.php as an example of how to use this class can be used. - It showed me how to use a ttf font file for creating UNICODE text images in GD images with imagettftext; imagestring was making the text too small.